I’ve just purchased a Raspberry Pi 2. I was perfectly happy with my Model B, but my exploding charger of a couple of weeks ago was plugged into the Pi at the time. I’d hoped that the SD card had been cooked rather than the Pi itself, but I’ve now found that the spare card isn’t working either. Which can mean only one thing. This entry was posted in Disaster, Technology on 30/04/2015 by garymoore. 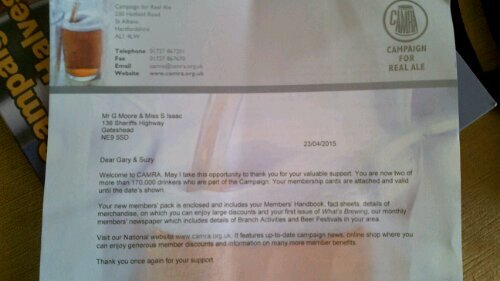 After considering doing so for some time, I’ve joined CAMRA. or, rather, we’ve joined, since membership’s pretty cost effective in multiples. For a very long time, I’d considered the organisation to be something of a beery antichrist, mainly due to the association of real ale with isinglass or, until cosmetics began using the stuff, collagen. But, in recent years, there’s been a sign of change. While still not exactly mainstream, more real ale brewers are producing unfined, or seaweed-fined, beer. So, I’ve had something of a change of heart. After all, if more vegetarians/vegans join, there’s surely greater opportunity to influence further change. The moral argument probably won’t succeed, but the question around polluting a natural product with fish bits might. After all, finings remove both taste and valuable nutrients. 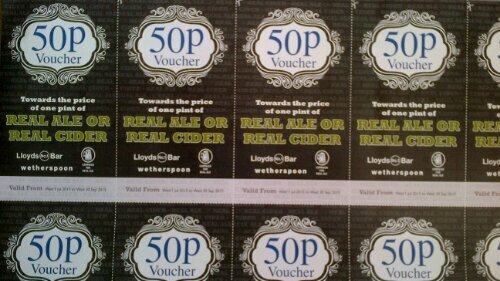 An unexpected bonus of membership is the ample supply of vouchers. Regrettably, CAMRA have a little more work to do in the quality department. I really don’t understand how such a large proportion of the UK population don’t have even a basic knowledge of the use of the apostrophe. This entry was posted in Beer, Grammar on 26/04/2015 by garymoore. All I want is black bean soup, and you to serve it to me. 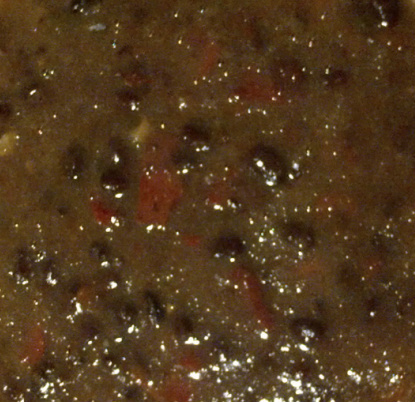 I recall an episode of Starsky & Hutch, from around 1975 or ’76, which involved black bean soup. And a little song about soup. Now, I know that I should feel a modicum of shame, but I was an impressionable child. And, of course, I was only two or three at the time. Anyway, when in Liverpool a few weeks ago, we bought some cartons of black bean soup from a most unusual shop. When sober, the soup didn’t seem very appealing, so it’d remained in a cupboard following our return home. However, after a long day in London, I decided to try some. I used to own a couple of Kirkland signature shirts. I say used to because they perished during a wash with my second in command’s chef whites. I’ve since bought another, but don’t often wear it because it’s not as non-iron as I’d believed. It’s quite nice though. I mention the shirts because, as I opened a carton of soup, I noticed that it too was branded Kirkland signature. I compared the carton with the label in my shirt and they were identical. It seemed unusual at first that a manufacturer would produce both shirts and soup, but, in my experience, the two do often go together. The soup was actually ok. The heap of pepper I’d added seemed to help. This entry was posted in Food, Vegetarian/Vegan, Weird on 15/04/2015 by garymoore. Another pretty cool long weekend involved some of my favourite pubs in both Peterborough and Newcastle. Worthy of mention are Charters and the Wortley Almshouses; the latter was visited a couple of times. Oh, and the Ostrich, where we saw a great band on Saturday evening. The following evening involved some truly nice real ale in Newcastle, from Out There, Atom and, perhaps best of all, Cloudwater. All unfined and vegan. This entry was posted in Beer, Pubs, Travel, Vegetarian/Vegan on 14/04/2015 by garymoore. Are never long enough. Still, the weather’s been gorgeous and some time was spent in pubs doing a lot less than we’d planned. Yesterday was particularly good, with live music and great beer in the sunshine in Ouseburn. There’d be pictures, but they’re on my phone and I’m too lazy to transfer them. The Tyne Bar has another great band this Sunday at three; we may be there if tbe weather’s ok (they’re using the outdoor stage). This entry was posted in Beer, Music, Pubs, Weather on 06/04/2015 by garymoore. 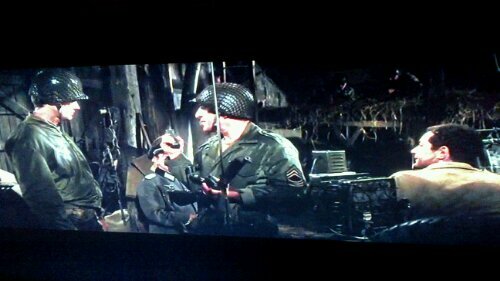 I’m currently watching Kelly’s Heroes, a film I first watched, in Sunderland, with mates, when I was around 14. So much time has passed since then; I have a grandchild of pretty much the age I was at the time, and a couple of that bunch of mates are no longer with us (Geoff Strong and Steve Aiken). Great memories. Years have passed and I keep thinking … burning bridges lost for evermore. This entry was posted in History, TV on 05/04/2015 by garymoore. After only ten years, the cold water tap in the bathroom washbasin is now working again. 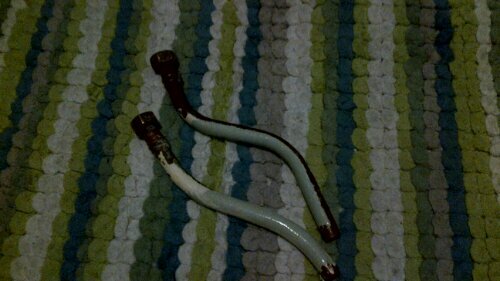 I tend to avoid plumbing, since I’ve had past disasters, but today I’ve successfully fitted new pipes, along with my first ever compression joints. This entry was posted in Disaster, Doing stuff, House on 03/04/2015 by garymoore. While it may be work in progress, and it’s a little buggy, there’s now a pretty decent email client for the Ubuntu phone. The set-up for my old BT account was really straightforward, although I’ve not yet had any success with my preferred account. It’s just a matter of looking up the right settings and a bit of trial and error, I’m sure. The connection issue over 3G’s still there, but it’s not happening every day and isn’t too much of a pain. I’m not at all regretting my move away from a mainstream phone and I have to say that I’m thoroughly enjoying the experience. This entry was posted in Technology on 03/04/2015 by garymoore. Yesterday, a copy of Focus on Low Fell arrived on our doormat. 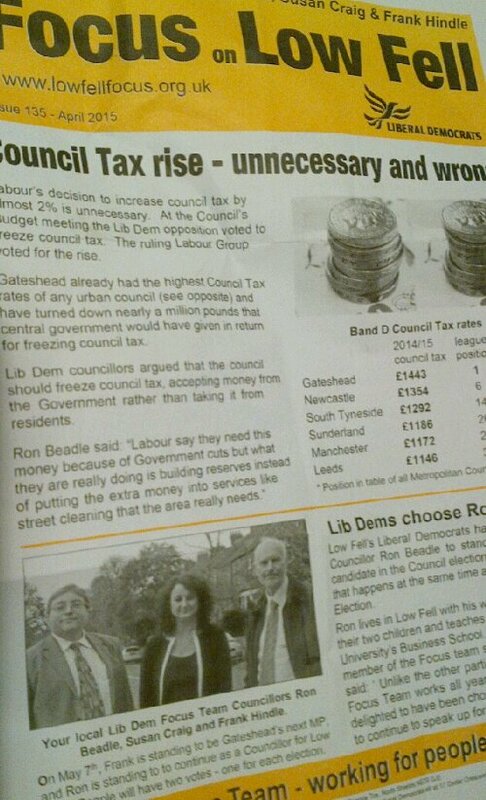 It’s an informative newsletter from our local Liberal Democrat Councillors, one of whom, Ron Beadle, will be standing in the forthcoming elections. Ron Beadle is pressing for Stratford Gardens and Denewell Avenue to be properly resurfaced after flood prevention work has been completed. Following a request from residents, Ron Beadle has arranged for a new grit bin near Berkdale Road and St Andrews Drive. Ron Beadle has asked the Council to improve road markings and the surface on Elder Grove. Ron Beadle recently arranged for a dead rat to be removed on Kells Lane. I must confess to imagining the Councillor in a cape. Yellow, of course. This entry was posted in Politics on 02/04/2015 by garymoore.